Despite the images of jubilant crowds in the streets of Britain’s capital, there were some, like Lance Forman, for whom those words spelled only dread and uncertainty. His 100-year-old, fourth-generation family business, H. Forman & Son, was facing eviction to make way for the Olympic Stadium, and teetered on the brink of collapse. 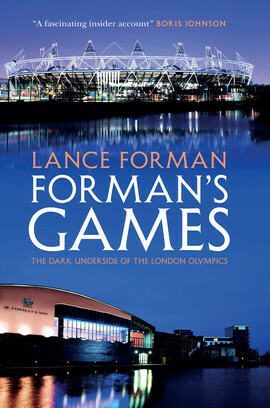 Lance Forman’s fight to save the firm brought him into open conflict with many powerful figures, including the then Mayor of London Ken Livingstone, and Sebastian Coe. A full, unexpurgated account of his fight to keep the firm alive, Forman’s Games lifts the lid on the fierce battle that pitched Forman’s, the country’s finest purveyor of smoked salmon, against the combined might of the UK authorities and the IOC in the run-up to the 2012 London Olympics. It is a story of skulduggery and bullying mounted against 350 local businesses, employing over 12,00 people, who stood in the way not just of the world’s most famous sporting event, but of an opportunity to develop the land on which they had successfully run businesses over decades.